Don't miss out. There's only 5 available and 6 other people have this in their cart right now. Don't miss out. There's only 1 available, and 6 other people have this in their cart right now. 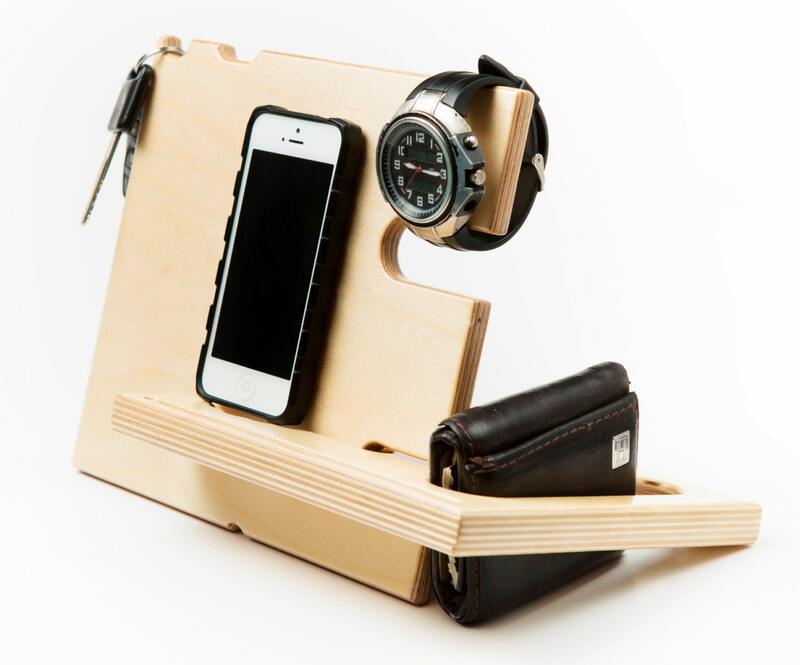 A phone dock gift to hold a phone, wallet, watch, keys, pen, glasses, etc. Easy assembly and great for travel. The Catchall™ is designed to provide a place for several items. It has slots for key chains, glasses, sunglasses, necklaces, bracelets, bluetooth headset, or headphones. It can be used to cradle your phone while charging, and there is no need to unplug the phone and thread the charger through a hole. Just slide the cable through the slot. There is also a slot directly below the phone charging area to allow your charger cable to pass-through. The Catchall™ has been designed to be compatible for most smartphones, including all Apple iphones and Samsung phones and works with most cases for these phones. There is a watch holder for your larger bracelets, watch, or smartwatch. There is a routed groove in the front for holding a pencil, stylus, or pen. The slot on the end is designed to hold your wallet. Although specific spots on the Catchall™ are designed with certain items in mind, the stand can also hold books, recipes, tablets, pictures, artwork, signs, etc. We are constantly finding out more things it can be used for. The Catchall™ is travel friendly. Disassembled, it lays flat and can easily be stored or packed. Assembly is also as easy as just sliding the two pieces together. The Catchall™ is not a permanent fixture that you have to screw to your wall. It goes wherever you want it to go.The Catchall™ is made from special, high quality plywood, which is known among woodworkers and craftsman for its exceptional strength and decorative edges. Unlike other plywoods, the inner plies in this plywood are hardwood and not softwoods. This is what gives the Catchall™ its strength and attractive edging with little to no voids that are commonly found in your standard plywood. This Catchall™ has been prepped and sanded with a birch raw wood surface for you to paint, stain, or mod podge it and give it your personal artistic flare. Assembled, it takes up about 7" x 11" of desktop space and stands around 8" tall. Great quality and useful! Thanks. Well made and very handy! For a full refund of purchase price, please notify seller and return within 30 days of purchase. Return shipping and packaging is the responsibility of the buyer. Seller reserves the right to refuse to refund the purchase price of the item if the item is damaged by negligence or improper packaging. Seller will not be held responsible for lost or stolen packages.